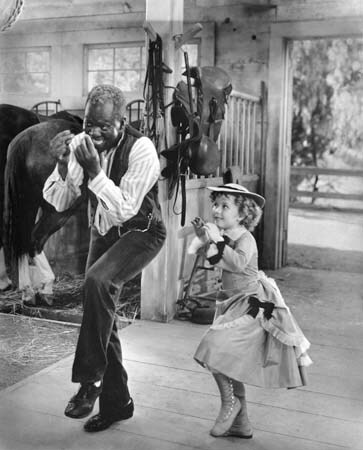 Today in my musical class, we discussed Bill Robinson and his role in several Shirley Temple films: The Little Colonel, The Littlest Rebel, and Dimples. I am probably one of the few people who has no fond childhood memories of watching Shirley Temple films. It’s even safe to say that I don’t like these movies at all. But Bill Robinson has always been the one part of these musicals I have ever enjoyed, both for the entertainment value he contributes to any film and the cultural signifcance of his work. Here is a clip of Robinson and Temple’s stair dance from The Little Colonel. My professor also showed this clip she found on youtube of Robinson performing another version of his famous stair dance routine. It is, for lack of a better word, really cool. It´s great! Robinson was a very good tap dancer.